Students and staff are putting in the miles by decorating bikes to be displayed along the Tour de Yorkshire (TDY) 2017 route. We got creative by decorating four surplus bikes, each representing Barnsley College, Barnsley Sixth Form College, University Campus Barnsley and Wigfield Farm. 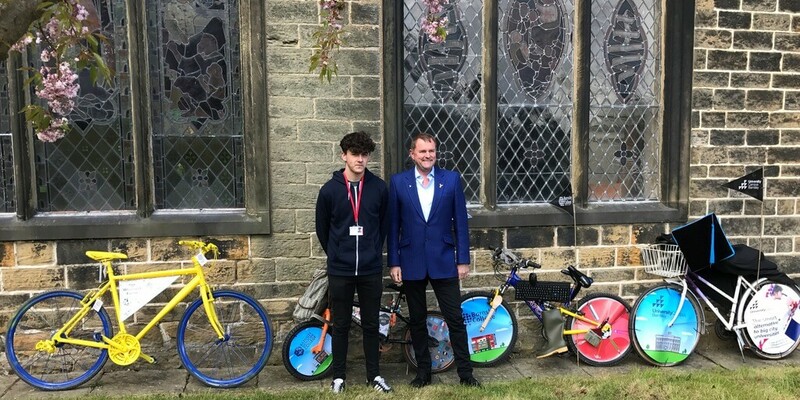 The bikes were given personalities and their own individuality, and were unveiled at a special event attended by Sir Gary Verity, Chief Executive of Welcome to Yorkshire. The bikes can be viewed at St Leonard’s Wortley Church during the event on Sunday 30 April. The Learning for Living and Work and Sports departments also got into the spirit by pedalling a combined 194km – the length of the stage three of the TDY from Bradford to Fox Valley, Sheffield. Phillip Spurr, Service Director, Culture, Housing and Regulation at Barnsley Council, added: “We are delighted that the UK’s biggest bike race will once again be travelling through our beautiful borough.